At work, we’re putting together a movie theme basket for our annual Community Fund Drive. The basket will be auctioned off to raise money for a local food shelf. The Community Fund Drive is near and dear to my heart as I have been handling all the communications for it for the past five years. This year, with my new Web Manager duties, I turned the communication responsibilities for the Drive over to my co-worker. She has been as passionate about it as I have, and it’s been heartwarming for me to know it’s in great hands. Through the Community Fund Drive, University of Minnesota employees raise over a million dollars every year (actually over $1.25 million) for lots of worthy local charities. It’s a great way, for us to give back. For our theme basket, we are including the following items. I’ll try to remember to snap a photo of the basket Monday morning, to include in a future post. Have you ever put together a theme basket for an auction, charity, or gift, and, if so, what did you include? Also, what do you think of the movie selection above? It wasn’t what I had in mind (my contribution to the basket was the candy). I think it’s definitely an eclectic mix of movies. Will such an eclectic mix make it appeal to a wider group of folks or a smaller group? Anyhow, the chillier Autumn weather and the thought of hibernating indoors in the cold Minnesota winter months ahead, curled up under a blanket watching movies, made me want to make a Fall dish. My mom always made “Nuts and Bolts” this time of year. 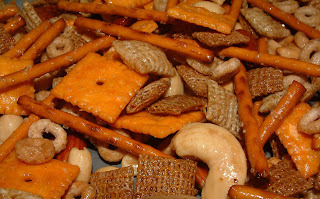 It was our variation of a trail-type mix and was a staple in our house from before Thanksgiving through Christmas. Combine nuts and all cereal and crackers in a big bowl. I couldn’t always find small package of some items, so you might just have to use half of a large one (or, in my case, because I was cutting the recipe in half, I only used a quarter of some). Melt butter in microwave. One pound of butter, by the way, is four sticks. After butter is melted, stir in celery salt, onion salt, and worcestershire sauce. 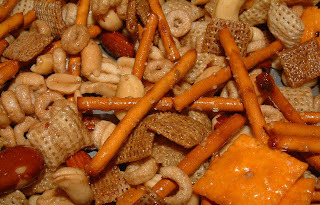 Pour over cereal, nuts, and cracker mixture. Stir well. Bake one hour at 250 degrees, stirring every 15 minutes. Then sit back, curl up under a comfy blanky, pop in a movie (I’m in the mood to see My Big Fat Greek Wedding for the sixth time), and munch away! This entry was posted in appetizer and tagged appetizers, celery salt, cheerios, cheez-its, nuts and bolts, onion salt, pretzels, rice chex, snacks, trail mix, wheat chex, worcestershire sauce. Bookmark the permalink.